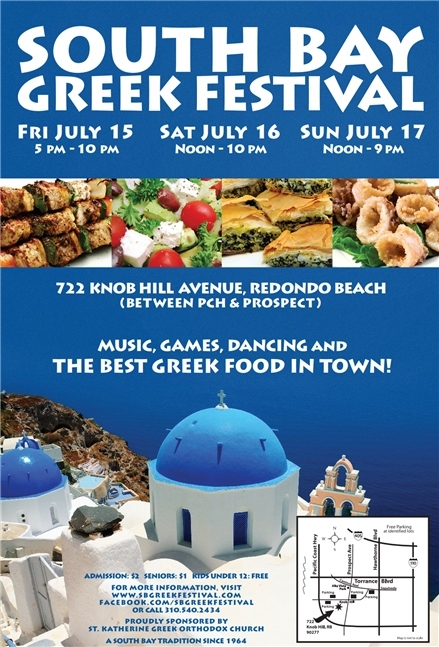 Hey everyone, don’t forget about the South Bay Greek Fesitval! The festival has something for everyone beer/wine/ouzo, amazing Greek food, music, and lots of family fun. An annual tradition since 1964. “Is this too much?” Helen Servetas of Manhattan Beach asked as she packed a walnut mixture into shredded phyllo dough. “You don’t have enough,” said Kristina Karabatos of Torrance, grabbing more phyllo to show the proper technique. “See, I’m still learning!” Servetas said. The two are 40-plus-year veterans of the South Bay Greek Festival, a weekend celebration of all things Greek that begins Friday — and, yes, that includes the food. But the food isn’t imported from fancy catering. The hundreds of baked goods come from an army of little Greek women, many of them Yia Yias — grandmas for the uninitiated — who pass their dessert recipes from generation to generation. The festival began 52 years ago at the Torrance Recreation Center but moved when the city tried to raise the rent, recalled Helen Brock, one of the original women who helped put together the festival. They made enough food for 1,000 people but ended up having close to 3,000. Now, the group prepares for nearly 10,000 and starts months in advance. This year, Maria Santy put together the baking schedule, which began in mid-May. Now, the process is made easier by a new state-of-the-art kitchen in the offices of the St. Katherine Greek Orthodox Church, where the festival will be held. 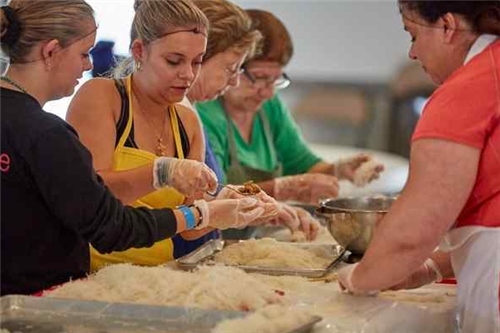 On Tuesday, just days before the festival was set to begin, groups baked 44 trays of homemade baklava and teams of women made kataifi, another Greek dessert. Panagiota Krikelos sprayed the phyllo dumplings with water to keep them moist until the trays were ready to bake. The festival is popular for a simple reason: People love authentic food. “We love to share our culture, our food, our kefi, like our energy,” Santy said. The group uses all of the original recipes, she said. While she might make a dessert a little differently in her home, the recipes have been handed down through generations. Recently, with more than 50 years since the festival began, there has been a passing of the baton from the older women to the younger women in the church. Helen Anastassiou of Redondo Beach, who has been assisting for 50 years, said the group picked the best recipes among the original women. The difference between their food and most food at a Greek restaurant is butter, she said. “All real butter. We have good ingredients,” she said. Mary Peters said what she enjoys about helping is getting to meet other churchgoers. For years, she has greeted women at church who she never met. But at the South Bay Greek Festival, she gets to know them. And, of course, she picks up little tricks to help out with her own cooking and baking. Finding younger women to help can be difficult, Peters said. But on Tuesday morning, two 16-year-olds, Valentina and Styliani Tragus, were just beginning to learn how to bake kataifi. They rolled their shredded phyllo with a long wooden stick a bit more slowly than the older women. Though their mother, Dena, makes the dessert at home, the twins had never made it. “But now they will,” Dena said. The two teens decided to participate because they wanted to help out in a substantive way. Though the South Bay Greek Festival is an event the whole family tends to participate in, many of the younger kids will assist with the raffle during the event, not with the preparation. “Yeah, we festival hop,” Valentina added. Typically, the parents bring their children into the kitchen at a young age to teach the ins and outs of Greek food, Dena said. Her daughters are always helping. The two assisted in making a dinner that morning, with one washing the peppers and another chopping, she said. “That is exactly our life,” both twins said in unison, and then burst into laughter.